That surprising statement has now been confirmed by a number of important studies in the Alps. The landscapes that we find so natural have in fact been modelled and remodelled by changes in the climate and multi-secular human activities. The ancient Mediterranean and Chinese civilisations greatly appreciated the contemplation and reproduction of landscapes. Lost for centuries, these activities were rediscovered by the West at the end of the Middle Ages and the Alps lie at the heart of that revolution. Sentimentalism lies just under the surface in us all and we need to uproot it. The history of landscape would appear to be a widespread and irresistible rise of blissful mawkishness that only a critical eye, patiently trained, can overcome. Today, everyone loves a beautiful landscape, but there was a time, alas long gone, when such unanimity of sentiment was not the fashion. Before « inventing » the regional nature parks in France some forty years ago, 14 grands voyageurs embarked on a world tour. A somewhat crazy adventure that elicited fond memories from one of the participants. Abelardo Morell, this U.S. photograph, born in 1948 in La Habana (Cuba) and today a professor at the Massachusetts College of Art in Boston, pays tribute to the great Leonardo da Vinci using a modified version of the camera obscura described by the Italian artist during the Renaissance. Beyond the col appeared a new expanse, full of mystery, danger and hope. On their way to discover a new part of the world, on the other side of the mountains, our ancestors experienced that precise moment in which the excitement of discovery was tinged with the fear of the unknown. A fundamental experience that certain Alpine landscapes, harsh and savage, call up from the depths of our shared memories. Whether wild or domesticated, a landscape is always an uncertain balance. To maintain that balance, humans must bring to bear their ingenuity… and respect. Through never-ending work, they have shaped the environment to their liking and exploited its riches. But without ever truly negating the imprint of nature. 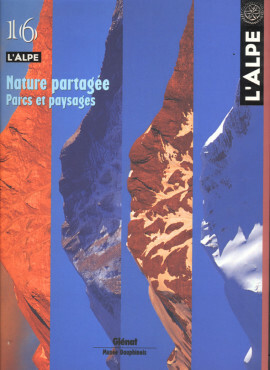 As much a social as a natural science, geography found in the Alps a choice terrain. Over the past two centuries, the work of the scientists has changed radically, shifting from naturalist and regional studies to a multi-disciplinary approach in which the Alps are today but one aspect among many. The history of this science is presented in an exhibition in Chambéry. Now domesticated, the Alps and their inhabitants have become the actors of a vast scenario. A show, cleverly organised (over centuries) for tourists in search of something out of the ordinary. Ah, the pristine Alps, a tremendous source of profit (and endless discussions) for years to come. No more just taking off and having fun. Now, people go back to nature to partake in culture and the hiker must have a serious excuse to simply walk a path. The Parks are now into art and how to teach it. For better or worse ? The menagerie was the theme suggested for all takers. In response, a wild and woolly bunch of animals invaded the offices of L’Alpe this spring. Our postman was amazed. We offer here a selection of the unexpected, colourful drawings, the staid images, the odd objects and the clever collages as a preview to the exhibition for all the artwork during the transhumance festival in Die. Today, one quarter of the Alps has been set up as protected zones. National and regional parks, nature reserves and other European programs are all the means to protect wildlife, plants and the landscapes, as well as the people who live there, work there and give life to the regions. A long history spanning a century, complex and occasionally divisive. Widespread in the Savoy, décor jaspé in ceramic dates from Antiquity. A technique that plays on abstract forms, but never completely severs the ties to reality in that from the beginning, it imitated the delicate veins of rare stones such as agate, onyx and marble. People’s fancy for the abstract marbled forms has ensured steady work for the traditional pottery manufacturers for more than two centuries. A situation that the ethnologists have not always fully understood. In Vallauris, near the Mediterranean, it was the Ligurian potters, on crossing the mountains as early as the 1400s, who imported their craft and their lifestyle. Décor jaspé decorated the Alpine clay until Picasso arrived to shake things up in the local habits.